Content Advisory: self . . . harm? Knitting is great. It’s helping me to stay calm and it’s fun and I love what it’s doing for me and my friendships. But double-pointed needles are a problem. So, I wrote earlier about being a teenage kid sitting in my room and digging into the center of my palm with a tack. What I didn’t mention is that I have started doing this again. Not with tacks anymore, but with, say, double-pointed needles. 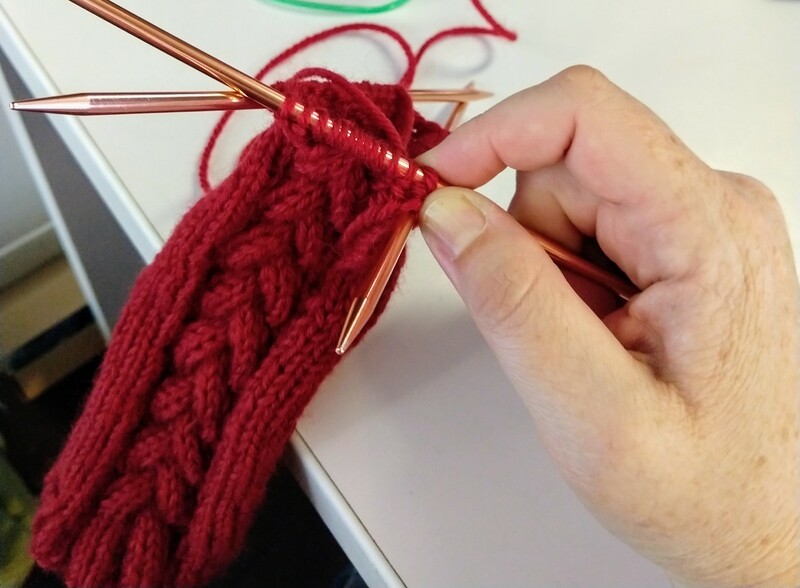 Without even thinking or meaning to, as I work with the double-pointed needles, I press one into my right palm. I am literally doing it in this picture in which I’m showing my cabling work, without thinking about it. And I’ve developed a callous with a hole in the middle of it, directly in the center of my palm. It’s hard to miss; I talk with my hands a lot. When I was young, I had no idea why I did this. I just did. It would relieve my anxiety and help me to focus. I dug into both palms with tacks, opened paper clips, ball-point pens, folded corners of paper, everything and anything. I developed callouses and holes back then, and they were blackened with ink. If it’s hard to miss now, there was no missing them then. Only once did someone mention it: I was in the back of the truck with a bunch of other women going toward a landscaping job when one said: “What a weird place to have a scar,” to me. “Yeah,” I said, and gave no further information. Literally no one else ever mentioned these deep black holes in the center of my palms that I carried around with me for YEARS. They just looked away. What a goddamned metaphor for my whole adolescence. Later, my mother told me she and my dad had figured I was only doing it for attention, so they didn’t give me any (my dearly departed dad is not alive to refute this, but it is true that he never broached the topic). While I realize this was a Very 80s Way of Parenting, it still pisses me off. If your kids want attention, GIVE THEM ATTENTION. This is not complicated. Anyway I eventually became extremely self conscious about this weird habit — I remember cutting off the calluses before a job interview with an exacto knife, and scrubbing them vigorously, so the interviewer would not see ink on my palms. And I was so, so ashamed of it. I briefly worried it was some bizarre Christ complex, or that people would think it was. I felt so dependent on it. This shameful awful secret that was no secret at all. Through adulthood, during very stressful times, I would find myself doing this again. I would look down and see first a red mark, then the callous, then the hole in the middle of the callous. It was a sign of stress, I decided, and backsliding, and it was Self Mutilation or Self Harm, so I had to stop for Growth and Healing. And it was so shameful, doing this. Adults don’t do this. I was ashamed. Then, during a time when I had gone for at least a decade not even thinking about that old shameful habit, and my hands were completely healed, I got acupuncture for my anxiety. The acupuncture points were all around my hand and wrist, but intense waves of intersecting electric sensation all culminated in the center of my palms. I lay there, first being ashamed that I found this so relaxing, almost asking the acupuncturist to shift the needles. But then as I lay there and felt the calm wash over me, and felt that electric sensation running through the very spots I had been poking at, I felt the shame flowing out of me. I now see it as this: I was trying to give myself acupressure to protect myself in the only way I knew how. All I knew was that intense sensation in that spot relieved a bit of anxiety, even if for a moment. Still, walking around with obvious holes in your hands is weird and embarrassing, so I made sure not to start up again, for years. When I brought it up with my therapist, she she immediately launched into planning about how to stop this dysfunctional coping mechanism. I joined her for a moment, but then I stopped myself. I’ve been having some pretty great weeks since I rekindled this weird old habit, and the only payment is a bit of embarrassment and self-consciousness (distinct from shame, but still it’s not pleasant to feel someone looking at my palm, or to worry that they are). So now we’re working on seeing this as, for now, a relatively benign form of coping with anxiety and stress. But I also don’t want to have to explain “this is a relatively benign form of coping with anxiety and stress” to people, or refuse to explain it, mysteriously, so I just ordered these self-adhesive acupressure beads. “It’s an acupressure bead for anxiety,” I can say if anyone asks.